A sensible alternative to the family beach wagon? Children come with a disproportionate amount of crap. For something so small, the necessary paraphernalia required to sustain these tiny individuals for long enough to leave the house is almost inconceivable. Simply venturing over the threshold of the front door requires volumes of equipment non-parents would consider sufficient for several weeks at sea. All of which means that the first port of call for new families is a trip to the friendly gold-chain-adorned used-car salesman. Gone is the stylish yet highly impractical 2 seater beach-buggy – you can’t stick a stroller in that. The new wheels of choice: a faceless, generic, isofix-enabled-5-star-safety-rated-high-riding MPV. Conveniently in baby vomit beige. Stoked. And cycling anywhere, let alone to the beach? Not an option. Definitely no longer viable. Leisurely cruising to the coast producing nothing more than a few beads of sweat safe in the knowledge that you won’t have to compete with those less environmentally considerate beachgoers for parking spaces won’t become a possibility until the kids have flown the nest. In 20 years’ time. Still stoked. But the cloud of doom may not reach quite as far as you initially thought. As with all aspects of parenting, defy convention slightly, and the rewards are great for both you and your kids. Burley has come up with something to satisfy those prepared to adventurously traverse the turbulent world of parenthood: a performance bike trailer suitable for carrying two children and an awful lot of their associated baggage. The Burley D’Lite neatly attaches to the frame of the bike with enough safety catches and straps to satisfy even the most paranoid parents. No need to worry that the beloved sprogs will become detached and left stranded in the middle of the traffic while you gleefully pedal up the road in ignorant bliss. Pouches, pockets, and compartments mean that there is space for anything and everything–there’s even a small trunk to ensure nothing needs to be left behind. Plenty of room for kids and kit. The biggest worry with anything that attaches to a bicycle is that it’s going to add too much weight; that it will be prohibitively heavy and make cycling a burden. But the trailer is light. Really light. Manoeuvring the D’Lite around unattached highlights the attention to detail and the success of using quality lightweight materials. Hook on, strap in the kids and away you go. On the flats, you barely notice that you’ve added an extra two wheels to your eco-friendly transport. The boards can come too. 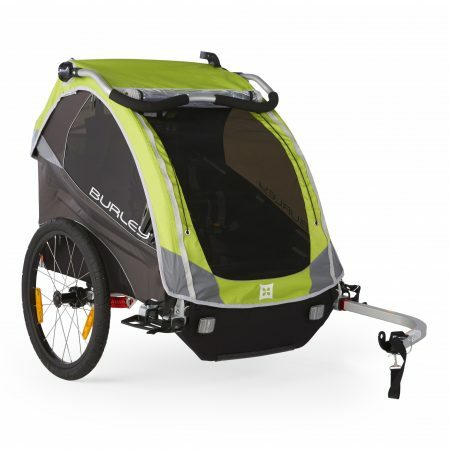 For more info on Burley’s range of bike trailers and accessories check out burley.com.